Heat Vs Cold With Pain & Injury - Emmett Technique Cairns Muscular Release Therapy, Australian made. 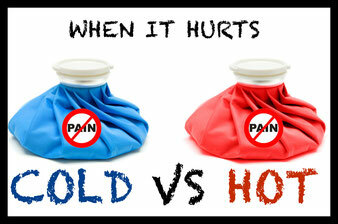 I get asked about Hot Vs Cold in pain & injury often. Here is a write up I found that might help next time you can not make the choice. When should I use ice on an injury? Immediately after an injury, fluid leaks from blood vessels into the injured area. Applying ice to the injured tissues helps limit the leakage of fluid from the blood vessels by causing them to constrict or become smaller. This reduces swelling and limits the amount of inflammation that will occur. In contrast, heating tissues causes the blood vessels to dilate or enlarge. This dilation can increase the amount of fluid that leaks into the injured tissue. This increased leakage leads to increased swelling and worsening of inflammation. Ice is most effective when applied immediately following an injury and during the first 48 to 72 hours after the injury has occurred. An easy way to properly apply ice is to use crushed ice in a plastic bag covered with a moistened towel. Such an application of ice easily conforms to the shape of the injured body part. Alternatively, a bag of frozen vegetables such as peas can be used in the same way. The cold pack should be applied over a moist towel on the injured body part. Apply for 20 minutes and remove for at least 20 to 40 minutes so that the skin is not injured from the icing. Your provider may recommend applications only a few times a day or throughout the day depending on the injury or condition. Do not use ice if the injured area has decreased sensation, poor circulation or an open wound. Seek medical attention. When should I use heat on an injury? Heat is not usually recommended during the first 48 to 72 hours after an injury. The use of heat during that time can dilate or enlarge the blood vessels leading to increased fluid leakage into the area. This fluid results in increased pain and swelling. After the first 48 to 72 hours, heat applications can be helpful, especially prior to recovery exercise workouts. The heat can improve blood flow to the area and aid in the recovery process. Heat provides an additional benefit by relaxing the muscles of the injured area so that workouts can occur as safely as possible. It’s important to keep in mind that heat can injure the tissues if it is excessively used. It actually can "cook" the skin, causing discolouration. Heat should only be applied for 20 minutes and should not be painful. Your provider may recommend heat application several times a day depending on the situation. Never sleep on a heating pad, as this is a common cause of skin burning. Moist heat by heating pad or direct moisture from hot whirlpool can be effective depending on the injury or disease involved and overall condition of the patient. The elderly should be especially cautious about using a whirlpool for therapeutic purposes and a provider’s advice is recommended.